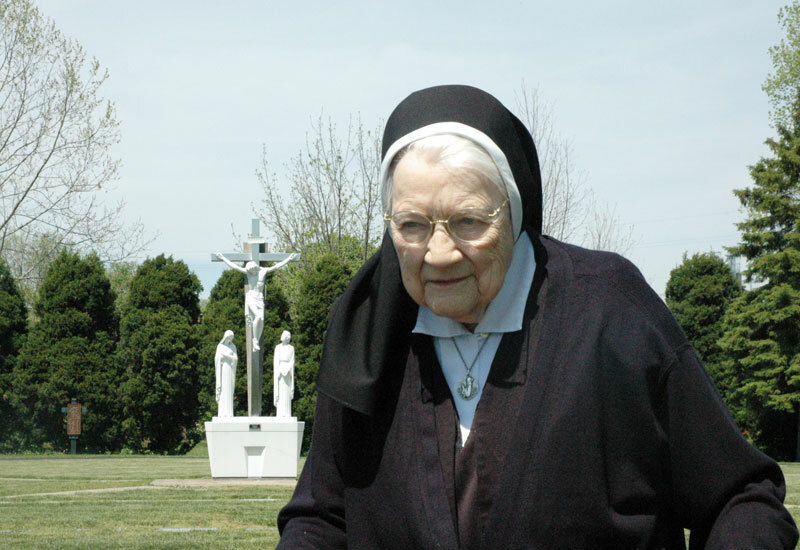 As she nears her 100th birthday on May 13, Benedictine Sister Mary Sylvester Will continues to take daily walks to the cemetery at Our Lady of Grace Monastery in Beech Grove, where she says she talks with her friends who have died and prays for those who are living. (Photo by John Shaughnessy) Click for a larger version. Her strong spirit soared early, sparked by growing up on a farm in southern Indiana and riding a long distance to the nearest Catholic school in a horse-drawn wagon. For 50 years, Sister Mary Sylvester Will taught at several schools throughout the Archdiocese of Indianapolis, unwavering in her commitment to share her faith, her knowledge and her love with her students—the names of every one of them lovingly written in her exquisite penmanship in the “little black book” that she still keeps and cherishes more than 30 years after she retired from teaching. Until her 99th birthday, she volunteered weekly at the St. Vincent de Paul Society food pantry in Indianapolis, even on days when ice, snow and bitter cold temperatures led her fellow sisters to recommend that she stay safely at their home at Our Lady of Grace Monastery in Beech Grove. Still, everyone who knows Sister Mary Sylvester understands there is one relationship in her life where she has always put her will aside. Her trust that God has always done—and will always do—what is best for her resonates in her thoughts about her upcoming 100th birthday on May 13. She shares those words with an almost child-like smile. For while her life has been marked by a strong spirit, it’s also been touched with immeasurable joy. That joy radiates on her face when she recalls Sister Pauline, her first-grade teacher whose love of God, children and life inspired her to become a religious sister and teacher. Her joy shines even more when she remembers her own students and talks about how she still prays for them as she holds the small black book filled with their names. Starting in the 1930-31 school year, she taught for 50 years, including assignments at Assumption School in Indianapolis, St. Paul School in Tell City, St. Michael School in Bradford, all now closed, and St. Mary-of-the-Knobs School in Floyd County. Some of her former students remember her as fondly as she remembers them, and sometimes there are unexpected reunions. “She enjoys things so much, and she has such a free laugh,” says Benedictine Sister Mary Carol Messmer. Sister Mary Sylvester keeps the joy and plays the dice game even though most of her sight has been taken away by macular degeneration. Still, she rolls her walker through the monastery, steering it often in the direction of one of her favorite places—the chapel. She’s there each morning, praying before the Blessed Sacrament. She wheels herself to the nearby cemetery every afternoon to talk with her friends who have died and pray for her friends who are still living. She also continues a 25-year tradition of leading a group of sisters as they pray the rosary for vocations. “She’s the most prayerful person I know,” says Sister Bernardine. For nearly 100 years, Sister Mary Sylvester has offered a countless number of prayers of thanks to God. Still, her most enduring legacy is that she has lived her life as a prayer of thanksgiving to God. The gratitude shows in the way she fondly recalls those horse-drawn wagon trips with her siblings and other children to their Catholic school—her first journey of faith with others. Her happiness also flows in the memories of her students, and the care she has extended toward people in need—including the way she stuffed 47 pillows last Christmas, hoping to bring a touch of comfort to military veterans at a hospital. And perhaps most of all, her appreciation for her life has always been reflected in her joy of being part of a religious community dedicated to God. She comes to all the meals, and attends all the events, Masses and celebrations within the community. One of the community’s next major celebrations will be on May 13—a celebration in honor of her 100th birthday and her 83 years as a religious sister. Listen to her fellow sisters talk about the birthday party, and it seems the event is as much a celebration for them as it is for her. That’s how much she means to them. Sister Mary Sylvester laughs, her spirit still strong and bright.